The Department of Labor and Employment (DOLE) is asking airline companies particularly the Civil Aviation Authority of the Philippines (CAAP) to implement the exemption of Overseas Filipino Workers (OFWs) in paying travel tax and terminal fee. 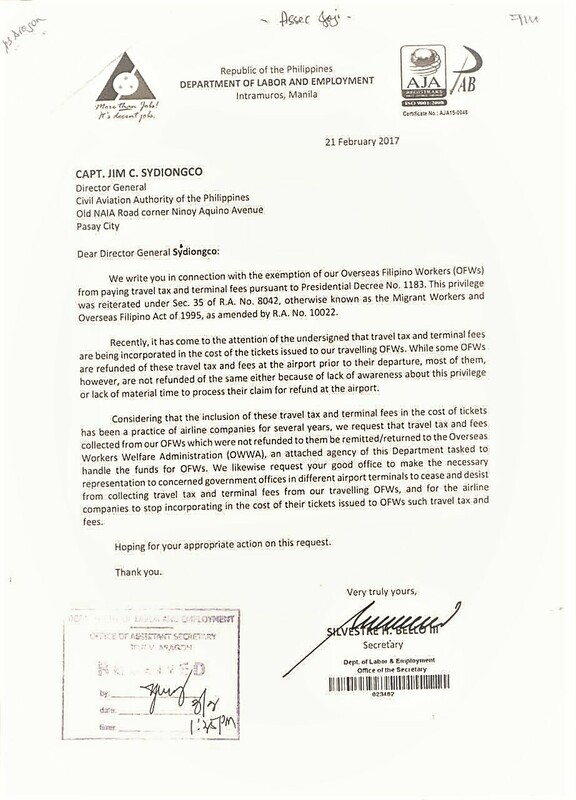 In his letter to Captain Jim C Sydiongco, director general of CAAP, DOLE Secretary Silvestre Bello III, reiterated that OFWs should be exempted in paying travel tax and terminal fee pursuant to Presidential Decree No. 1183, Republic Act 8042 or Migrant Workers Act and Overseas Filipino Act of 1995, as amended by Republic Act 10022. 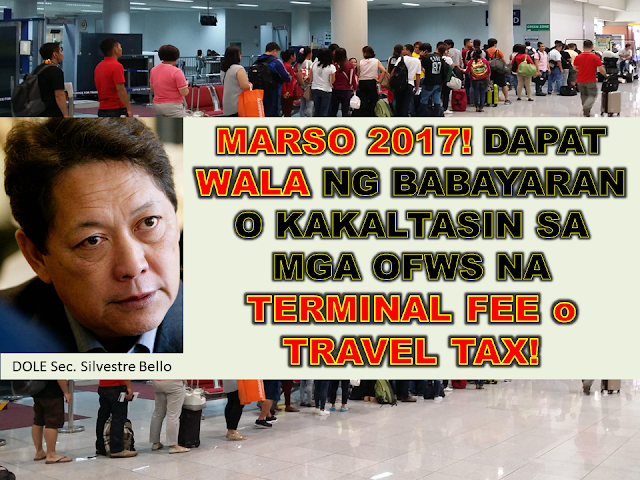 In the same letter, the DOLE chief said that the travel tax and the terminal fee are incorporated in the cost of plane tickets issued to OFWs. Bello is asking Sydiongco to make a necessary representation of his office to concerned government offices in different airport terminals to cease and desist from collecting travel tax and terminal fees on OFWs. Bello said, while some OFWs are refunded with these travel tax and fees at the airport before departure, most of them are not refunded with the same due to lack of awareness or lack of material time to process their claim for refund in the airport. DOLE is also requesting CAAP to transfer the travel tax and fees collected from OFWs which were not refunded to them to Overseas Welfare Workers Administration (OWWA). 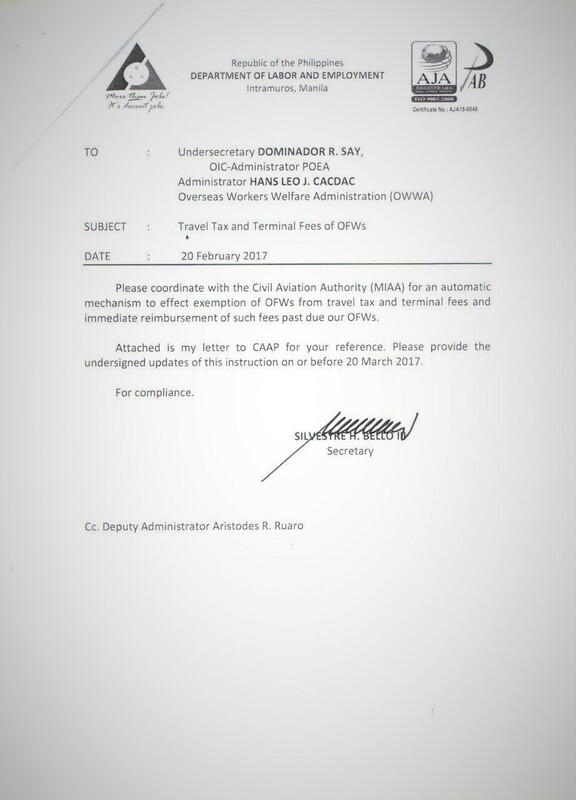 On his separate letter to DOLE, Undersecretary Dominador Say, Bello instructed the official to coordinate with CAAP for an automatic mechanism to take effect the exemption of OFWs from paying travel tax and terminal fees, along with the immediate reimbursement of such fees past due to OFWs.